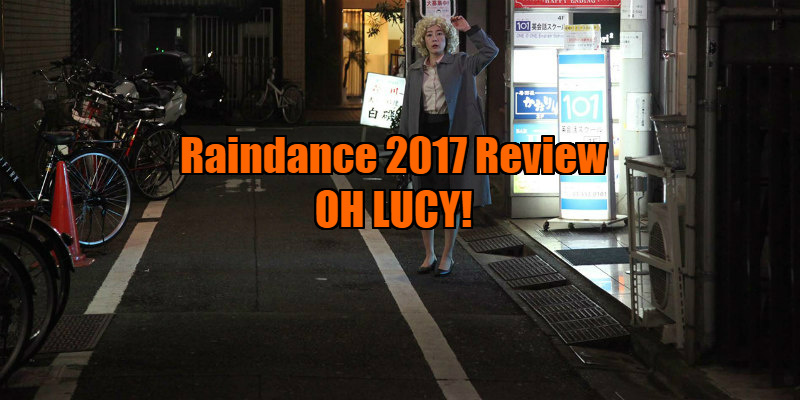 Raindance 2017 Review - OH LUCY! A lonely Japanese woman travels to the US to reunite with her English teacher. Oh Lucy! is a feature-length expansion of Japanese filmmaker Atsuko Hirayanagi’s award-winning 2014 short. In this tragi-comedy she elaborates on her themes of isolation and identity, and examines the rewards of human connection, but also its risks. Oh Lucy! tells the story of Setsuko Kawashima (Shinobu Terajima), a lonely, lovelorn, middle-aged office worker in Tokyo, whose daily experiences comprise of a dreary commute to an unfriendly, back-biting office, and a return home to a tiny, cramped and messy flat. She is worn down, disillusioned and chain-smoking her way to an early grave. Setsuko’s favourite niece, the pretty but feckless Mika (Shioli Kutsuna) persuades her to continue attending the English lessons she’s previously paid for, but has now abandoned. Inside a shabby classroom in a disreputable part of town, Setsuko meets her handsome English teacher John (Josh Hartnett), a self-confident American who greets her with American bonhomie and an unexpected hug. John’s teaching method consists of creating an ‘English Only Zone’, renaming Setsuko ‘Lucy’, and making her wear a curly blonde wig. She meets Takeshi, a fellow student, renamed as ‘Tom’ and also forced to wear a dreadful wig. They are encouraged to practice informal American manners and colloquial greetings. Setsuko disapproves, but John’s unconventionality and attractiveness draw her in, and the close physical contact of his hugs awaken repressed longings. Setsuko hangs on to the wig and returns for more lessons, only to find that John and Mika, her pretty niece, have run off to California together. Setsuko receives a postcard from Mika containing a return address, and she decides to set out to California to find her, and John too. Inviting herself along is her sister Ayako (Kaho Minami), Mika’s acerbic and controlling mother. Setsuko and the snippy Ayako track John down, but Mika has now broken off the relationship and moved away, and the trio must now go in search of her. Although her quest is under the guise of familial responsibly, Setsuko's journey to the US has been prompted by more personal reasons, which she herself doesn’t entirely understand. When Setsuko finds herself in Southern California she begins to absorb the easy-going Western influences and quickly begins to shed her inhibitions. This familiar collision of cultures moves the film into more challenging territory. John is flattered by Setsuko’s ever more ardent attention, and is charmed by her child-like enthusiasm for unfamiliar experiences. He teaches her to pump gas, to smoke spliffs, and encourages her to try her hand at driving. However, it soon becomes evident that he is as much of a screwed-up mess as she is, and not in control of his life. Setsuko's impulsive passion for John may have more to do with what he may represent - the idea of getting away from herself and her colourless life. Under the blue skies of California, she grows increasingly bold and obsessive. As Setsuko’s ardour grows increasingly vehement, her behaviour becomes more extreme, and events take a darker turn. Having begun as a droll observation of Japan’s lonely people, Hirayanagi’s film begins to examine more sombre notions of how the attraction of the ‘alien’ often falsely provides the possibility of escape from the mundane problems of one’s own life - or how by fixating on another person, or another place, we try to avoid our personal issues. All the characters are guilty of this to some extent. There is little sentimentality in Hirayanagi’s screenplay. It is sharp in its criticism of the expectations placed on women of all cultures to find their ultimate fulfilment in marriage or romance, although Setsuko herself never comments on her single status, except to confirm that her scheming sister stole her boyfriend and married him. A wonderfully nuanced central performance from Terajima keeps the narrative grounded through some erratic tonal shifts, and Hartnett makes the most of the somewhat underwritten role of John, whose initial confidence belies the fact that he is also adrift. The funny and antagonistic interplay between the two sisters is marvellously conveyed by Terajima and Minami (who apparently had no previous rehearsal). Oh Lucy! might initially play like a standard culture-clash comedy, but soon reveals itself to run significantly deeper. It offers moments of genuine emotional poignancy, and fittingly enough, within sight of the dream-factory itself, it unravels the Hollywood myth that ‘love conquers all’.